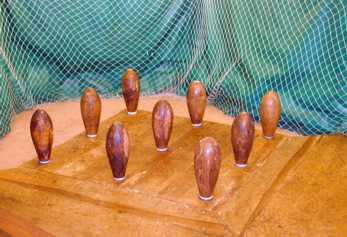 Figure: Anut Sally, players throwing batons at a wooden skittle known as a doll. Figure: An English bat and ball pubgame played between two teams of either six or eight players. Alternately one team is batting and the other team is bowling. Figure: men running downhill to be the first to catch the cheese. Figure: A woman plays Conker, a traditional British game played by using chestnuts. 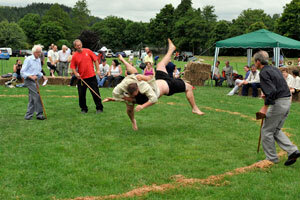 Figure: Two men playing Cornish Wrestling, a old wrestling game established in Cornwwall. Figure: Players ready to throw the dodgeball to the opposing team. If they can catch them, they are out of the game. Figure: A ball game played on a court enclosed on three or four sides. Figure: In London skittles you knockdown the nine pins by throwing a cheese through the air instead of a ball. Figure: A game similar to cricket, played on a grass field between two teams. Figure: A table, nine skittles and 3 wooden cheeses, the material needed to play table skittles.